The answer is on the next page in a single, larger frame. Fortunately, Kuper breaks the form with regularity. Not that he changes his panel pattern, but his mostly wordless, woodcut style cartoons don’t strictly follow his dictum: some aren’t literal points of view, some are imagined visual histories, and some are the desires of his hapless figures. 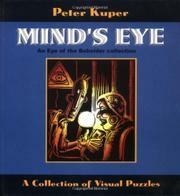 Many of Kuper’s visual puzzles are politically pointed, with the pay-off frame packing the punch of an editorial: four views of white people tanning are seen by a black janitor; various guns on a rack are ogled by a young boy; floating garbage is viewed by a mermaid; a defoliated forest is watched by Tarzan.The best comics are the most surprising ones: four different frames seen by, among others, a window washer, a crash-test dummy, a construction working using a jackhammer, and a new-born baby. Often the four views serve as a visual history, with the punch-line frame including the person visualizing the past: a hotel maid sees the various inhabitants of the room she’s cleaning; a piece of gum on someone’s shoe ends a sequence on the history of its manufacture. The wittiest pieces confound reality: a jar of pills views its consumer in various stages; a turkey flashes on its future as dinner; and the Grim Reaper surveys his victims. Kuper uses himself to great effect: circling sharks turn out to be the lawyers surrounding him at a table; trees being converted to wood products end up in his hand as pencils; and, funniest of all, scenes of an empty bookstore are his views at a book-signing. Kuper’s black-heavy style, best used in his narrative work, here deadens jokes that need air and light: he’s a great talent who hasn’t yet found a subject suited to his style.